Silver American Eagle 1 oz. Each coin is 1 troy oz. (DATE OF OUR CHOICE) MINT SEALED Box of Silver 1 oz. American Eagle - Qty 500 Coins. 500 Silver American Eagle 1 oz. In a mint sealed monster box. The mint box is sealed with the original mint straps. 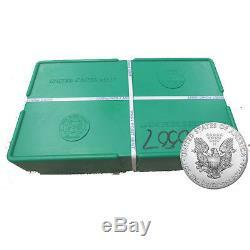 Each box contains 500 silver american eagle 1 oz. The mint boxes still have the original mint straps attached. All the coins inside of the box will be the same date. Date of the mint box is fulfilled on a availability in the warehouse. The United States Mint first released the Silver American Eagle Coin in 1986. Since then, the American Eagle has become one of the most popular silver coins in the world. 999 pure silver, making this one of the finest silver coins ever minted. The obverse side of this large coin features a design based on the earlier Walking Liberty coin, while the reverse side features an image of a bald eagle holding a shield beneath 13 stars.. UPS will attempt 3 Deliveries at the location. UPS Ground with Signature Confirmation. Is this Mint Box Sealed? Yes, each mint box is sealed with the original mint straps. What Year are these coins? All of the coins inside this mint box are the same year of Silver Eagles. The box year is the date of our choice. #14-234, Dana Point, CA 92629. Hours - Nights & Weekends. We try our best to reach each customer in a timely manner. The item "500 Silver American Eagle 1oz Coins Sealed US Mint Sealed Monster Box" is in sale since Monday, August 1, 2016. This item is in the category "Coins & Paper Money\Bullion\Silver\Coins". coins" and is located in CA, MA, NY. This item can be shipped to United States.